President Trump Says He Won't 'Rule Out' Military Option In Venezuela : The Two-Way The Pentagon says it has not received any orders from the White House concerning such action. Trump has criticized President Nicolas Maduro's moves to consolidate power. President Trump says he is "not going to rule out" military action against Venezuela following President Nicolas Maduro's moves to consolidate power in recent weeks. Venezuela's defense minister responded Friday evening that such talk is "craziness." Also Friday, the White House said Trump would only meet with the Venezuelan president "as soon as democracy is restored in that country." On Thursday, Maduro had said he wants to meet with Trump and instructed his foreign minister to try to arrange a telephone conversation with the U.S. president. 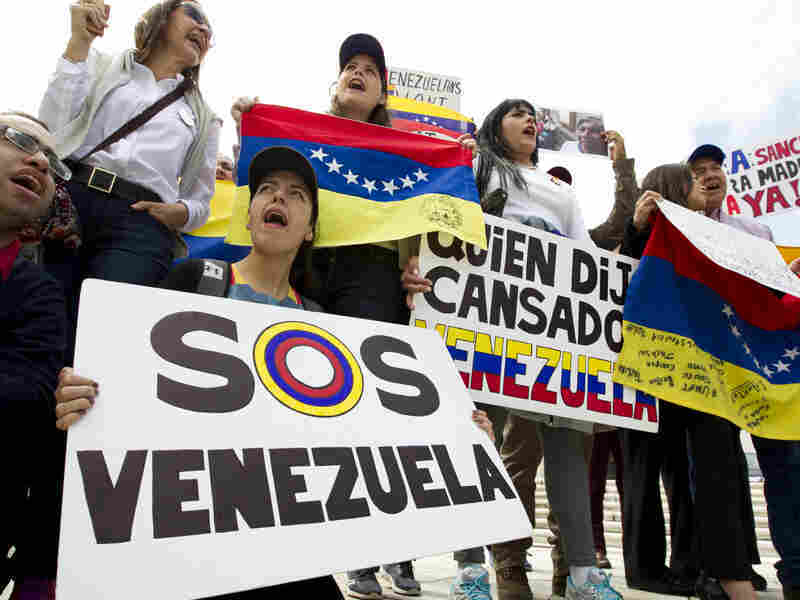 Demonstrators protest President Nicolas Maduro's moves to consolidate his power outside a special meeting of the Organization of American States in Washington on Apr. 3. "Mr. Donald Trump, here is my hand," Maduro said, adding that he wants as strong a relationship with the U.S. as he has with Russia, according to The Associated Press. As to U.S. military action against Venezuela, the Pentagon said it had not received any such orders from the White House. Asked about specifics, Trump said: "We don't talk about it but a military operation – a military option – is certainly something that we could pursue." The remarks come amid increasing concern about Venezuela and increasing unrest there following a vote that installed a new legislature beholden to Maduro. Venezuela's Defense Minister Vladimir Padrino said in a tweet that Juan Carlos Caguaripano, the alleged ringleader of the Aug. 6 attack on a military base near Valencia, had been captured. "This capture has dealt a hard blow against terrorism," Padrino tweeted.